I have repeatedly had about ten to twelve years from Vac 51s before resac is needed. If you like the way the pen works, that shouldn't be a show stopper. It is an older design and it has its charm. If you like the aerometric 51 but like the Vac cap, get a Vac cap and use it with an aero. You often find 51s with parts that weren't original, and I have bought aero models on ebay that came with a Vac cap. Vac filler cool? I never was confident I had enough ink in the pen. It always seemed that I had to press the filler as many as 43,647,323 times, and even then no idea if it were full. A perfect example of what I want: that type, that colour, that cap. I bid $110 and it went for about $140. That gives an idea of what I was prepared to pay. 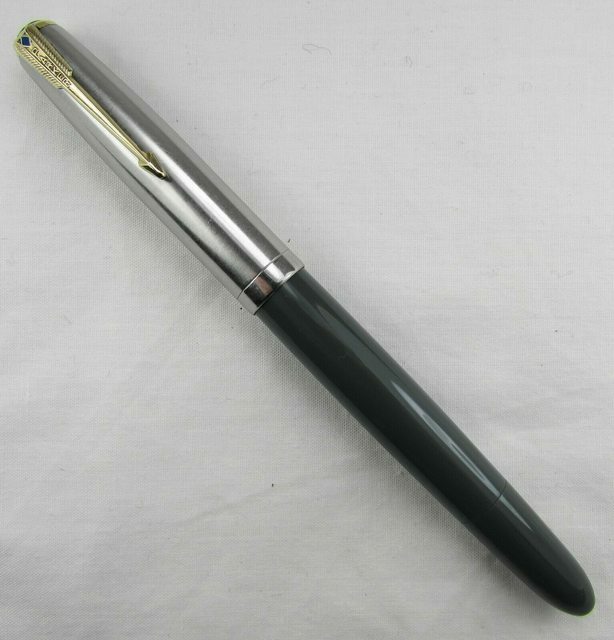 The question is whether that is an unrealistic price in general for a pen of this condition/type - and that the winning bid was just overenthusiastic. If you have sixteen or so bucks, and aren't at all particular, you might buy a Wing Sung 601 'vac' filler. I don't even know if it is an actual vac filler, but it has an ink window. And comes in all sorts of colors. What more could you want? I think the correct question is "How many bucks are in an 'or so'?" Nope, I'm (hopefully) going to get one decent 51 before I kark it, and the one in the picture is about as close to ideal as I can find. Just have to find another one (cos that one is sold). Could take a while with only the cesspit of the internet auction sites to go by. Edit: a little help would be appreciated. Last edited by Empty_of_Clouds; April 6th, 2019 at 12:24 AM. So, you are looking for a Cedar Blue 51 Vac with the blue diamond cap. Shouldn't be that hard to find. Prices have gone up, but the people who like Vac 51s, and who must like resacs every few years, seem to be driving this. I think it is really nostalgia. You could get a 51 Midnight Blue aero and get a spare Blue Diamond to use with it. 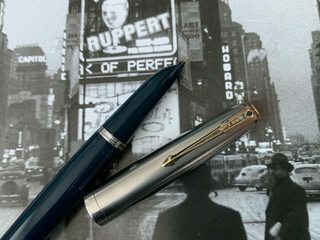 I sometimes use a Blue Diamond cap on one of my Midnight Blue aeros because my Cedar Blue Vac 51 needs a resac. I have a Wing Sung 601 Vac filler. This feels better than a 51 Vac, but the nib is different. It's no less smooth than a Vac 51, but it is not the same in feel. It appears to be a very well finished pen. I am waiting to see if the sac lasts longer than a 51 Vac's sac (oops, diaphragm). I would like to get rid of my 51Vacs, but I don't feel like doing the resacs. Haven't seen another one like this yet, though I am looking at a dark grey version (same cap). The cedar blue vac in the picture is my ideal 51. Last edited by Empty_of_Clouds; April 11th, 2019 at 01:40 PM. hah! Got the dark grey one. Not as nice as the cedar blue but people without pen-related friends can't be choosers. Dark gray? Would that be a Navy Gray aerometric filler? 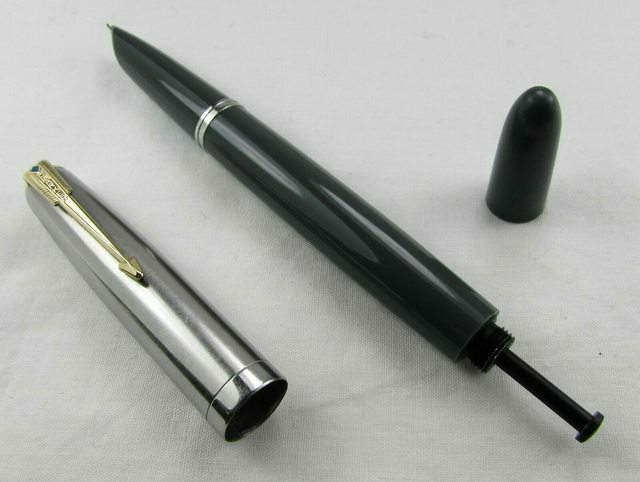 The Vacumatic gray is a light gray. This one. I guess it's the Navy grey? Although under $100 I probably overpaid, but other options were slim to non-existent. Last edited by Empty_of_Clouds; April 11th, 2019 at 06:42 PM. I think you did well. That is a beautiful pen. Seems like a good find and reasonable price from what I have seen them go for the last 6 months. As long as it writes. The cap I like, the colour of the pen is acceptable rather than preferred though. The price? As noted elsewhere, I have no idea what is a fair price for 51s, as Bay prices are all over the place. I would be delighted with that pen at that price, in that apparent condition, if it is working. You seem to favour the vacs. I do too. My daughter has a cedar blue aerometric in pristine condition which she received as a birthday gift. It is a beautiful colour and still going strong. The pen above in navy gray is aerometric. The Vac gray is a lighter shade, dove gray. Cedar Blue is a Vac color. The aerometric dark blue is Midnight blue. Confusing. Maybe they should have used the same names and colors. That might have been confusing too. What is the date code and which imprint is on the barrel?